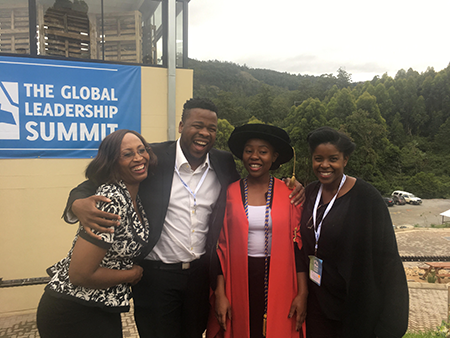 Now a postdoctoral research fellow in the Global Innovators Forefront Talent (GIFT) research niche area within the Faculty of Economic and Management Sciences at the North-West University’s (NWU’s) campus in Mahikeng, Musa spoke at the summit, which was held in Swaziland on 15 and 16 November. The Global Leadership Summit is a two-day training event in world-class leadership and is held in different locations around the world. Musa was invited as one of the faculty of speakers, taking her place alongside world-renowned leaders and speakers such as Cheryl Sandberg, COO of Facebook; Marcus Buckingham, author and founder of the Marcus Buckingham Company; Laszlo Bock, senior advisor at Google; Bryan Stevenson, founder and executive director of the Equal Justice Initiative; Venete Klein, former chairperson of the IoDSA and board member of the South African Reserve Bank; and Dr David Molapo, founder and president of the I CAN Foundation, among others. “When I received an invitation to be one of the speakers at the Global Leadership Summit 2017, I was in absolute awe as it dawned on me that my efforts have had a ripple effect in attracting greater international attention as more people and organisations are showing a keenness to hear my story,” said Musa, who received her PhD in Industrial Psychology at the university’s campus in Mahikeng in April. This was not the first time she has been ahead of her peers. Musa started her BCom at the age of 16 and completed it at 19. She followed that up by completing her honours and master’s degrees at 20 and 21 respectively, both with distinctions. “It was such an amazing experience to speak about my journey, the ups and downs, the failures and the triumphs and how I ultimately prevailed and continue to prevail regardless of the challenges that life confronts me with. Equally exciting for me has been the humbling opportunity and responsibility to represent my continent and more sentimentally, my institution, the North-West University,” added the Zimbabwe-born academic. Since speaking at the summit, Musa has been approached by many institutions and organisations that are front-runners in youth empowerment to give encouragement and motivational talks to youths from different backgrounds across Southern Africa. Dr Musa Saurombe (red gown) with some of the Global Leadership Summit 2017 attendees.